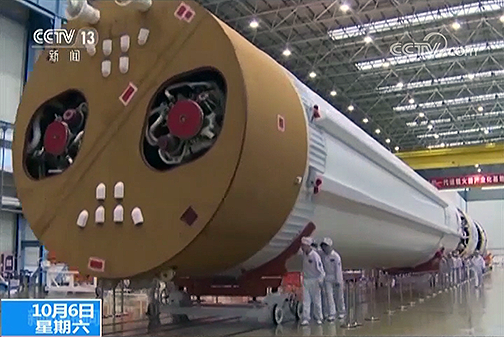 A frame grab from CCTV showing the components of the third Long March 5 rocket undergoing tests and assembly in Tianjin in early October of 2018. 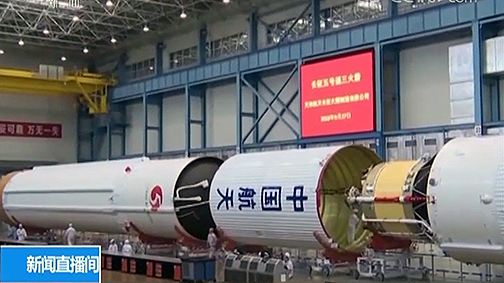 China's largest rocket is undergoing final assembly at a facility in Tianjin ahead of launch vehicle shipping to a coastal launch site for what will be a crucial mission for the nation, as is being reported in gbTimes online infosite. Footage aired on China Central Television (CCTV) on October 6 showed components of the Long March 5 at the factory under the attention of engineers. The two-stage, 5 meter in diameter, 57 meter tall tall Long March 5 launch vehicle is by far the largest and most capable in terms of payload capacity that China has developed. This third Long March 5 rocket is being readied to launch a near-8-metric-ton experimental communications satellite named Shijian-20 to GEO during January of 2019. After a successful maiden flight in November of 2016, the second failed to reach orbit in July of 2017, severely disrupting China's space plans. That failure delayed a number of major missions, including the Chang'e-5 lunar sample return mission which was scheduled for November of 2017. The cause of this failure was determined to be damage to the turbopump on one of the two cryogenic YF-77 first stage engines, prompting a redesign of the structure and test-firing in Xi'an. A frame grab from CCTV showing components of the third Long March 5 rocket undergoing tests and assembly in Tianjin, China, in early October of 2018. A variant named the Long March 5B had also been expected to have a test flight ahead of lofting the first 20-tonne module of the Chinese Space Station (CSS) into LEO. Success of the upcoming launch will be crucial to progress on China's lunar, space station and interplanetary exploration plans, with the Long March 5 also to launch an orbiter and rover to Mars in summer 2020. After testing and assembly of the third Long March 5 in Tianjin, north China — expected to be completed later this month — two cargo ships designated Yuanwang 21 and 22 will travel from the Yangtze River to collect the components and transport them to the island of Hainan in the South China Sea. 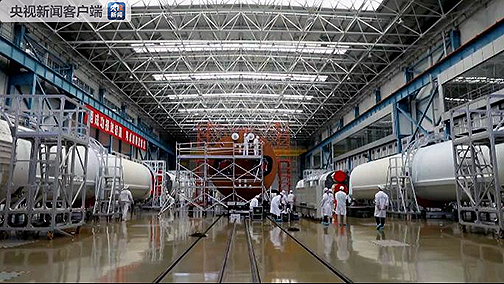 A CCTV frame grab of components of the third Long March 5 rocket undergoing tests and assembly in Tianjin, China, in early October 2018. Following this two-week process, a two-month long campaign to get the Long March 5 vertically assembled and integrate the Shijian-20 communications satellite with the rocket with take place at a vertical assembly and testing building at the Wenchang Satellite Launch Centre. Launch could then occur sometime in January which, unlike China's three closed inland launch sites, is expected to draw thousands of spectators.